You know what is ironic? Being a singing group on “tour” and having one planned performance- on the last night- and being totally cool with that. Being a group that does a large amount of music a cappella, we can perform anywhere for anyone at anytime. It’s great! We are able to give a gift of music in appreciation and this often results in impromptu performances. Over the course of our week in Manitoba, we performed for audiences as small as two and as large as 100. We never tire of the looks on faces as we express our gratitude for their sharing of their time, their expertise, their resources with us. We bless them with a song. On this trip, more often than not, the first time someone heard us was when we sang for them – at the END of our time together. Somehow it seemed totally fitting that we would have our biggest performance on the last night. 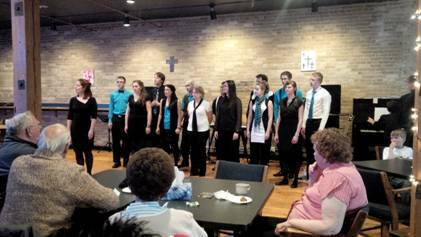 It was a fundraiser for Forward House hosted by Eastview Community Church in lieu of their regular church service. Eastview Community Church (www.one88.org) is a cool place. Every stereotype you have about church goes out the window. For one, it meets in a warehouse that has been converted into a coffee shop lay out. So everyone sits in comfy chairs around tables and there is a coffee bar where you get your drink etc. at any time prior, during or after the service. Secondly, it meets on Thursday nights- they don’t call it a church service, they call it a gathering. And thirdly, the congregation is an intentional community made of a mix of lifestyles. The variety of people is astounding. There are core area visitors who happen to come across the building, there are men from Forward House who attend Thursdays and other functions, and there are Eastview community members. “Everyone from young and old, from rich to poor, from broken to unbroken.” There are business people, seniors, families, individuals on parole with their parole officers and people recently released from prison. Many of the men on parole or post parole have come to Eastview through Forward House. When Forward House, and its director Peter Harzan, responded to Pat Nixon’s suggestion that they use us for a fundraiser event, they took a huge leap of faith … we were sight unseen, sound unheard. Eastview Community Church, and specifically Greg Armstrong and Dave Ens, took a huge leap of faith by not only allowing us to use their very cool venue, One88, but giving us their entire weekly gathering time slot- and endorsing us to their community. We were blown away by the response. “One more thank you for a blessed time with Harmony Through Harmony. Spiritually, emotionally and in every other way it was a special afternoon and evening (and all night actually). The script was wonderful, the voices beyond compare and the members are so committed to their ministry and the ministries they come in contact with. It has been a pleasure to meet such devoted people to such a worthwhile endeavor. Just this evening alone you have influenced people from such a variety of backgrounds. From non-believer to believer, from rich to poor, from broken to unbroken. Bravo to all. I look forward to our next meeting and look forward to planning a more detailed and further reaching event. My prayers are with the group as some return back to Calgary for work etc. and some continue on to Ontario. Keep up the work the Lord has asked of you. No-one will forget the songs you sang tonight but if you think they will, then like the lyrics said “sing it anyways”. A great way to wrap up a great week in Winnipeg.